Paul Graham, one of Silicon Valley’s most notable Venture Capitalists and co-founder of Y Combinator, published an article in August, 2015 noting that obtaining the best .com domain name was less about getting users and more about signifying strength. All one has to do is look at Nissan.com to understand the headaches associated with someone else owning a name resembling your brand. Over ten years later, and multiple lawsuits later, Nissan (the car manufacturer) is no closer to obtaining the domain owned by Uzi Nissan (yes, Nissan is a last name), and rightfully so. Why should the domain name go to someone just because they are bigger and more well-known? After all, Nissan is his family heritage and the name of his company. UberCab, which was founded in 2009 by Garrett Camp and Travis Kalanick, first launched services in San Francisco in 2010, using the eponymous URL www.ubercab.com until it was forced by San Francisco and California regulators to drop the “cab” from its name. Uber has continued to grow in the past five years, expanding in markets and size. The company that was valued at $60 million in February 2011 now has a valuation of more than $62 billion. It has expanded beyond San Francisco to more than 180 cities in the U.S. and 60 countries around the world, and its car service may be just the beginning — Uber is exploring ways to use its delivery platform in other ways. Recent rollouts include UberEATS, a local food delivery service launched in 12 major cities, and the announcement that Uber would help distribute AMBER alerts via its data network. At about the same time that it changed its name from UberCab to plain ol’ Uber, Uber bought uber.com from Universal Music Group. Because the young company was cash-strapped, they offered — and UMG accepted — a 2-percent stake in their company in return for the highly desired domain. They later bought this stake back from UMG for $1 million. So, essentially, they acquired this must-have URL, which is now priceless, for a cool million. Not bad at all. Although Uber may have been originally forced by regulators to change its name from UberCab, it’s undoubtedly a move they would have made at some point anyway. After all, Uber is essentially a technology company, and their continual forays into other services using their delivery platform shows that they know this and are looking at the ways to best monetize it. Uber as a brand is both highly adaptable to a number of scenarios (i.e., UberEATS, UberHEALTH, Uber EVENTS) and very valuable. After all, “uber” means the best of whatever you are, and Uber is striving to be just that for a number of things. And they’ve got a boatload of uber domain names in their portfolio to prove it. Uber cool. UberCab had no chance of ever becoming a verb. Twitter was first developed by Jack Dorsey and Noah Glass while they were working at Odeo, a podcasting company, in 2006. Dorsey envisioned the service, which went by “twttr,” as an SMS-based service that people could use to track their friends through status updates. Users would send a text to one main number and that text would then be broadcast out to all of their friends. SMS short codes are five digits, so they tried to get twttr, but Teen People were already using it (well, they were using txttp, which is numerically the same as twttr). A bird enthusiast originally owned the Twitter.com domain, and company co-founders weren’t willing to spend the money to buy the domain name from him until they were confident their platform would catch on. (An early logo features bubble-font lettering in green, making “twttr” look more like “twtta,” which we kind of love.) A lot of joking references have been made to the long-running Wheel of Fortune television game show, at the fact that within just six months, the powers-that-be were willing to purchase the necessary vowels to take control of Twitter.com. It may have seemed like a big deal then — since Odeo had basically foundered and Ev Williams had bought back the stock from investors and taken control of both Odeo and Twitter — but the reported $7500 paid for the Twitter.com domain makes us wonder, from the perspective of a decade’s hindsight, why they even waited at all. The Twitter founders got a bargain by getting their preferred domain name early in the game, before even they knew how successful the service would become. So Yang, a senior engineer at Google, returned to his native China in 2011 to found the Anker brand. Four years later the company is reportedly doing over $100M in sales annually and is consistently one of Amazon’s top sellers. With rumored plans to go public in 2017 its no wonder they upgraded from ianker.com to Anker.com in June, 2015 paying a reported $130,000 USD for the domain name. The first look at iAnker poses a question of who they are? Is it I AnKer, are they trying to say I An Ker? This upgrade to eliminate brand confusion were dollars well spent. Bitly began in early 2008, with an initial $1.5 million in seed funding from New York City-based VC firm BetaWorks (they also chipped in more money during another round two years later). At the time it was one of a handful of URL shortening companies, including TinyUrl.com, and it has since emerged as the dominant player in the field. Bitly never seemed to have a problem getting users to use a domain with an uncommon .ly extension, but the company began redirecting bit.ly to bitly.com in 2011. Libya, which owns and controls the .ly extension, closed down one or two other domains, accusing them of being anti-Muslim. However, some experts believe that Libya was only able to do this because those sites let their domains expire, though it can enforce the requirement on country codes that users must have a local presence. Either way, the bit.ly domain has been extended through May 2022. Bitly is not the only URL link shortener out there and with the acquisition of Bitly.com they now have a top level domain to compliment the brand. Think Google’s Goo.gl, Twitter’s t.co, YouTube’s youtu.be, etc. The brand names stand alone as domain names while shorteners live on in other extensions (t.co, goo.gl). By shifting to Bitly.com instead of domain hack bit.ly, the company now comes across as more than just a one-trick pony and shows the authority that tech companies need. It also reduces the risk of operating under a domain name that is is regulated by the Libyan government. This risk alone made it worth upgrading due to the unpredicitability of how some countries regulate country code extensions. Imagine being a company founder and waking up to this article referencing an extension your company is formed around. When Jack Dorsey (Twitter’s co-founder) and his friend Jim McKelvey originally thought up the idea of Square, which would allow merchants to accept credit card payments via smartphones, the story is that they went to the dictionary and came across the word “square.” Connotations of the word that fit their concept included the expressions “fair and square” and “square up,” which means to settle a deal (with money, one hopes, not with fists). It didn’t hurt that using Square as the company’s name also gave them a design for their hardware, either. Not unexpectedly, square.com was not available when the company launched, so Square took instead the domain squareup.com, which was a good second-choice pick. More recently, Square bought the square.com domain for a reported millions of dollars. The company is consistently referred to as Square in media everywhere. There was no logical argument NOT to acquire square.com. Our guess is thousands of people email someone @square.com every month thinking they were reaching squareup.com. This email vulnerability alone (especially for a payments processing company) is enough to warrant paying top dollar for the preferred domain. Let’s remember a key point here. Secondary words like GET, INC, LLC, CORP, PLAY, etc. are not your brand, nor will people (including employees) remember them. What people remember, and what the media often refers to, is the primary word of your company name. We live in a short world. Your domain needs to be short. This story is a perfect example of the difference between a good-enough domain and the perfect domain. Getdropbox.com was a good choice of URL for a startup when DropBox found that its first choice was unavailable and it needed to roll out its product and business. However, once its product became successful and word started spreading, potential customers assumed they would find the recommended site at the product’s URL. The need to acquire the preferred domain (dropbox.com) became almost mandatory. When Mark Zuckerberg first launched “The facebook” while still an undergrad at Harvard, he was said to have named the social platform after the papers that were distributed to freshmen to tell them more about other students and staff. The platform rapidly expanded outside of Harvard to other Boston-based colleges and then colleges and universities nationwide. In August 2005, Zuckerberg spent $200,000 to purchase facebook.com and dropped “the” from the company name and its URL. While that was no small amount for a year-old company, a decade later Facebook easily shelled out $8.5 million for FB.com, which tells a lot. Facebook wasn’t a new concept at the time — MySpace had launched a year earlier, based on Friendster’s original concept — but Zuckerberg was able to build and grow it into the wildly successful social platform it is today. While he may have been able to name it anything he wanted and still have it turn into the 800-pound gorilla in the industry, the history of branding shows that one-word names seem to find the most success. And when your name becomes synonymous with the activity your product actually does (i.e., Hoover), you know you’ve caused a societal shift. Zuckerberg has always been a visionary, and streamlining both the company name and its domain name in the early years undoubtedly helped Facebook on its meteoric ride. Plus, it appears to have helped save the company the millions of dollars it would have needed later on to get its coveted domain name. Anytime a company drops THE from a domain name, it becomes more much authoritative. You never want to be known as THE ____ company. Imagine our world if brands used THE in domain names. THEcocacola.com, THEFedex.com, THEtwitter.com .. Oh please, shoot me now. Instagram was launched in October 2010 by Kevin Systrom and Mike Krieger as a mobile photo and video-sharing social platform. In a little more than a year, it had 10 million users. Facebook acquired the app in 2012 and it continues to grow to this day, especially among the younger crowd, who have grown up with smartphones and image sharing, and prefer the social network to Facebook. Instagram didn’t just come out of nowhere. Systrom had actually developed, and gotten funding for, a prototype of an app called “Burbn,” which was a location-based check-in app similar to Foursquare. However, after receiving $500,000 in investments and hiring Krieger as the engineer, they looked at Burbn and decided it was too cluttered and needed to be stripped down. Because the photo component was the most popular one with beta users, they kept that feature — along with comments and “like” capabilities — and started again. They named the new app “Instagram,” an amalgam of “instant” and “telegram” that also sounded “camera-y,” in the words of Systrom. Nobody, not even the two founders, could imagine how rapidly their app would be downloaded from the moment it appeared in the Apple App store. Less than four months after launch, Instagram secured $7 million in a round of funding, putting its valuation at $20 million. At the time, Bloomberg Business noted that the company didn’t even have “real company” accoutrements, such as its own permanent Web address. It was using instagr.am. Systrom made the decision to pay $100,000 to the owner of the Instagram domain name in January 2011. In 2014, however, a relative of the seller denied that the seller had had the authorization to sell the domain, and wanted the domain name back. Facebook won the 2014 UDRP case, which also included 21 other similar domains that were a typo or two away from the Instagram.com URL. Domain hacks look cool but should always be secondary URL’s. When instagr.am launched practically everybody called it Instagram –- they didn’t pronounce it instgr.am (can you even pronounce that?). Always try to acquire the domain your employees and customers will pronounce by default. After Dennis Crowley sold Dodgeball to Google in 2005 and then left the company in 2007, he went on to create Foursquare — essentially the next-generation of Dodgeball’s location-based social network — in 2009. While you wouldn’t be the first to wonder whether Crowley loves playground games, he has stated in the past that he always wanted to use the name “Foursquare,” but settled first on Dodgeball when the foursquare.com domain wasn’t available. When he started all over again, he had no such qualms and just went with playfoursquare.com to get the new company going. And it did start out as a mobile gaming app tied into the location-based services, so that “play” in the URL made sense. After Foursquare’s first round of funding, the acquisition of foursquare.com was a top priority. In fact, in mid-2014, Foursquare spun its gamification component into a separate app called “Swarm,” (the domain is for sale) and became even less about gaming and more about personalized local search. While Foursquare users don’t pay for the service, the company has worked to leverage its knowledge of locations and user visits for revenue-making purposes. Many products and platforms use the Foursquare API — including Twitter, which uses it to geo-tag tweets — and the company’s deep data is anything but child’s play. The removal of “play” in their domain makes them sound a little more grown up and, more importantly, shows that their Foursquare service means serious business (regardless of the fact that they briefly, and unintentionally, let the domain name expire in March 2010). Simple. It shows there is a proven method for choosing the right domain name. We live in a world where consumers (and employees) embrace the natural, short versions of domain names. All of these companies (and thousands more) have invested in a better domain name for reasons that make sense across the board including economics, brand recognition, email security and more. 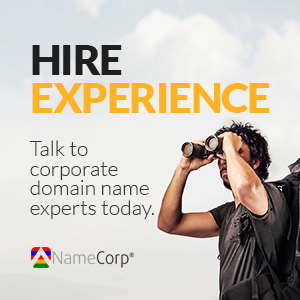 If you haven’t considered upgrading your domain name then maybe you should. You never want to bet against human nature.